New technology and gadgets do wonders for improving our day-to-day lives. We all know how convenient fitness trackers are at encouraging us to pursue our aims, or how a smart lighting system is so much easier than hitting the light switch manually. Crowdfunding sites, in particular, are full of innovations like these, but there’s much more going on out there. How about all those weird inventions you had no idea you required in your life? Here are the 10 most unusual that came out of 2016. Continuing the environmentally aware theme, Foldscope is a portable and versatile microscope that just happens to be made mostly out of paper. Despite its humble beginnings, its magnification and resolution is sufficient for imaging live individual cells, embryos, swimming bacteria and much more. It’s great for science buffs who want to get out and about to look at things, while not being swamped by too much bulky equipment. 2016 was quite the year for unusual tweaks to familiar chores. The Drumi is a foot-powered washing machine that uses minimal amounts of water and no electricity. That makes it ideal for small spaces, and the climate conscious amongst us. It only takes about 5-10 minutes per load, using 80% less water than standard washing machines. It’s small enough to take camping or on a weekend getaway too. Menstrual pain is an issue for most women on a regular basis. Livia means they don’t have to worry about taking painkillers to ease their suffering. It’s marketed as an “off switch” for such pain, effectively shocking away cramps. It works by stimulating the nerves, blocking the pain from passing to the brain, closing the ‘pain gates’. It sounds unlikely but it’s gleaned some great results for many. A pain-free life is always welcome. Reimagining the lunchbox doesn’t sound that unusual, but Prepd Pack really does change things up. It’s a case that houses a modular system of containers and smart magnetic cutlery. Each compartment provides a place for different parts of your daily needs. A bundled app further extends the potential by encouraging you to follow set recipe plans that also slot in perfectly. It’s perfect for the organized person, especially if they’re working on keeping healthy. Washing clothes has evolved over time but never quite as drastically as in the case of Dolfi. A hand-size device, it cleans your clothes with the power of ultrasonic technology, ensuring it sounds distinctly futuristic. It’s ideal for hand-wash only items, gently cleaning your clothes while still being thorough. Portable, you can take it wherever you go too, proving ideal for regular travelers. Simply put everything into a waterproof container, and Dolfi does the rest. Yup, it’ll feel like strange magic. The Anova Precision Cooker is the kitchen tool you never knew you needed. It allows you to cook “sous vide” which means restaurant quality results. The real beauty behind it is you’re able to control it through your iOS or Android device, meaning you don’t have to stress over timings and being too accurate. Consistent results mean tender and moist food every time. It’s kind of a quirky concept as it involves putting food in a ziplock bag to cook, but it’ll revolutionize your cooking style. Huge fan of honey and willing to put your money where your sugar loving mouth is? Flow Hive was the strange gadget for you in 2016. It made it simple to harvest pure honey directly from a hive, avoiding mess, fuss, and reducing the disturbance for the bees. Ok, so it’s a niche gadget, but it’s the ideal thing for people who have always wanted to get into beekeeping, but wanted a simpler way of doing so. Many home owners like to see birds visit their garden. Bird Photo Booth made it even easier to witness such events unfold. It’s a bird feeder that also works as a wireless 4k motion-activated camera. Any time a bird visits, you can remotely watch and photograph their activities, giving you some great insight into what birds visit your home. It’s sure to be oddly compelling viewing. Carrying around a bicycle helmet is frequently quite awkward and cumbersome. FEND worked on eradicating that problem. It’s a foldable bicycle helmet. As soon as you finish using it on your daily commute, you can easily store it in your bag for later use. The beauty being that it’s still just as safe as a conventional, bulky cycle helmet. It’s also fully breathable, ensuring there’s no excuse not to wear it. 2017 is going to be notably safer for many. Is there anything stranger than the LICKI Brush Probably not, which’ll explain why it created so much interest this year. 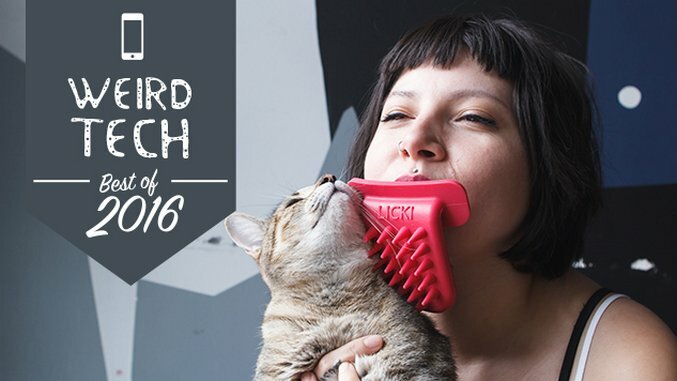 The Brush allows you to lick your cat. Yes, really. The gadget fits in your mouth so it’s hygienic, as you “lick” your cat, thereby forming a stronger and more intimate bond between you and your beloved pet. It might sound weird to some, but it’s been quite the hit, easily surpassing its Kickstarter goal.